Dentin is one of the most durable biological materials in the human body. Researchers from Charité – Universitätsmedizin Berlin were able to show that the reason for this can be traced to its nanostructures and specifically to the interactions between the organic and inorganic components. Measurements performed at BESSYII, the Helmholtz-Zentrum Berlin's synchrotron radiation source, showed that it is the mechanical coupling between the collagen protein fibers and mineral nanoparticles which renders dentin capable of withstanding extreme forces. Results from this research have been recently published in the journal Chemistry of Materials. In humans, teeth come into contact almost 5,000 times per day under normal use. In spite of this, and although we often use large forces during mastication, it is surprisingly rare for healthy teeth to break. It is widely accepted that the design of teeth makes teeth tough, where an inner core, known as dentin, supports the outer hard enamel cap. The secret to the marked toughness lies in the structural details. Dentin is a bone-like substance, which is composed of mineral nanoparticles, collagen and water. While both enamel and dentine are composed of the same mineral called carbonated hydroxyapatite (cHAP), dentin represents a complex nanocomposite material. It consists of inorganic cHAP nanoparticles embedded in an organic matrix of collagen protein fibers. 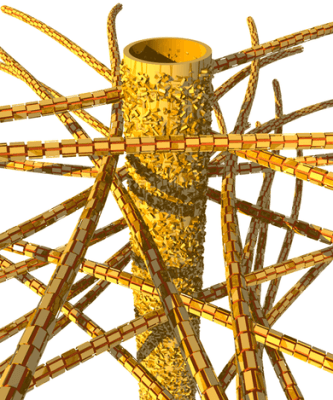 A group of researchers, led by Dr. Jean-Baptiste Forien and Dr. Paul Zaslansky from Charité's Julius Wolff Institute, had previously shown that residual stress in dentin contributes to the high load-bearing capacity of this biological structure. Compression stress found within the material can explain why damage or cracks in enamel do not extend catastrophically into the dentin bulk. As part of the new findings, Dr. Zaslansky's team used samples of human teeth to measure how nanoparticles and collagen fibers interact under humidity-driven stress. “It was the first time we succeeded in precisely determining not only the lattice parameters of the cHAP crystals contained within the nanoparticles, but also the spatially-varying size of the nanoparticles themselves. This also allowed us to establish the degree of stress they are generally able to withstand,” says Zaslansky. In order to gain insights into the performance of the nanostructures involved, the researchers used both laboratory experiments and measurements obtained using the Helmholtz-Zentrum Berlin's synchrotron radiation source BESSY II, a device that produces radiation frequencies ranging from terahertz to hard X-rays. As part of their experiments, the researchers increased the compressive stress inside the dentin samples. The samples were also dried by heating them to 125ºC. This resulted in the collagen fibers shrinking, leading to huge stress being exerted on the nanoparticles. The ability to withstand forces of up to 300 MPa is equivalent to the yield strength of construction grade steel, and is comparable to 15 times the pressure exerted during mastication of hard food, which usually remains well below 20 MPa. Heat treatment did not lead to the destruction of the protein fibers, suggesting that the mineral nanoparticles also have a protective effect on collagen. Analysis of the data also showed a gradual reduction in the size of the cHAP crystal lattices as one moves deeper into the tooth. “Tissue found near the dental pulp, which is formed during the later stages of tooth development, contains mineral particles that are made up of smaller cell units,” explains Zaslansky. The nanoparticle length shows the same trend, with the mineral platelets situated near bone on the outer parts of the root measuring approximately 36 nm in length, while those found near the pulp are smaller, only 25 nm long. Such a design could be used as a model system for new materials development, for example when designing novel dental restoration materials. “Dentin's morphology is considerably more complex than we expected. Enamel is very strong, but also brittle. In contrast, the organic fibers found in dentin appear to exert exactly the right pressure on the mineral nanoparticles that is required to increase the material's repetitive, cyclic load-bearing capacity,” argue the scientists. At least, this is the case as long as the tooth remains intact. Bacteria that cause dental decay soften and dissolve the mineral, and produce enzymes that destroy collagen fibers. Teeth become more fragile as a result and can then break more easily. The findings of this study are also of interest to practicing dentists. Dr. Zaslansky explains: “Our findings highlight an important reason for doctors to keep teeth moist during dental procedures, such as when inserting dental fillings or installing crowns. Avoiding dehydration may very well prevent build-up of internal stresses, the long-term effects of which remain to be studied."